This medium Schmiere appears noble in a black tin can. For month the raven got portraited while he added some new tattoos to his plumage nearly every day. The ravens' elaborated hand-drawn portrait is perfectly completed by the likewise pencil drawn tattoo designs. Of course this beauty is still missing in your collection. Go and grab it! 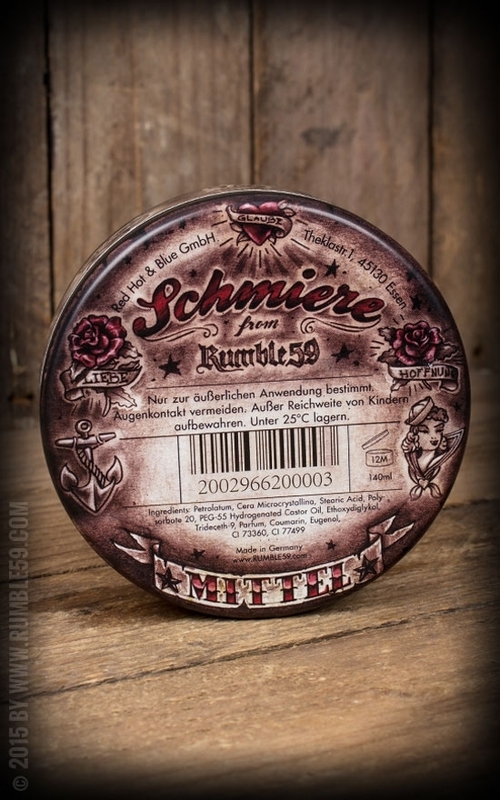 Perfect 50s styling with the medium Schmiere by Rumble59. After the Schmiere raven has been in search of new challenges very long he just opened his own tattoo studio called "Rote Tinte" which means 'red ink' in English. At the beginning he had some difficulties with the tattoo-gun and it was many red blood which flowed mostly instead of red ink. But after numerous improvements on his own feathered body he handles every kind of tattoo style by now. He's looking forward to welcome you in his studio! 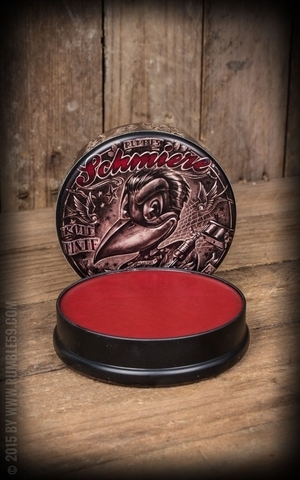 The Schmiere "Red Ink" has a medium hold. It has a dark-red colour and smells tasty like licorice/ cherry. For weeks the raven himself has worked on this very special flavour. 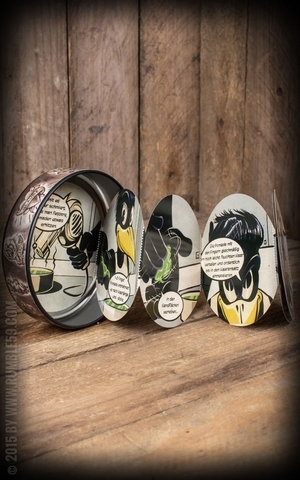 The high-class and black tin can houses a 140 ml content. 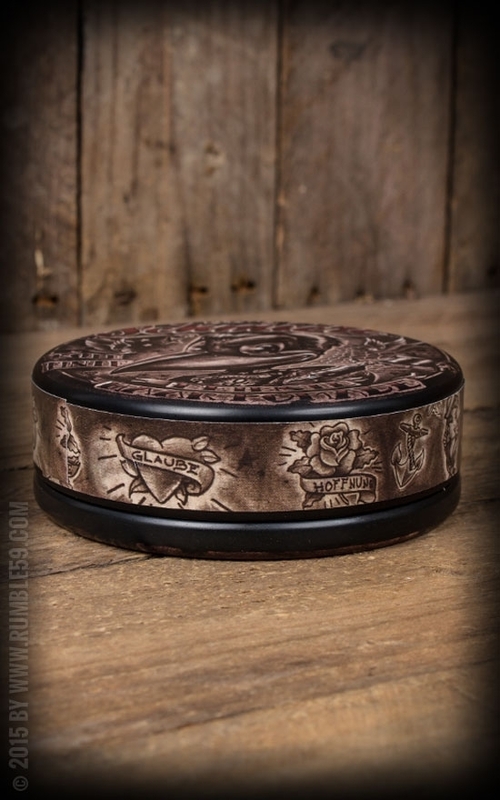 The printing of this tin can is well worth seeing due to the hand-drawn designs. 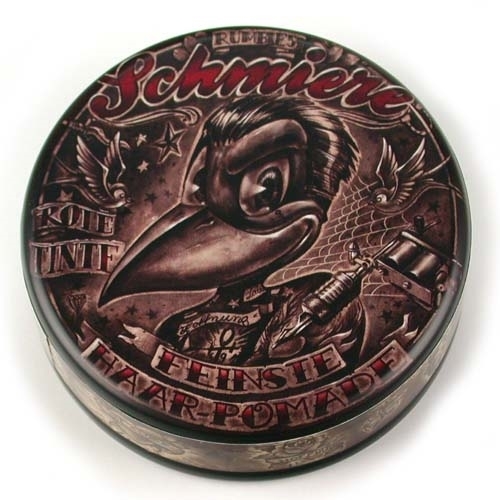 Of course this variety by Schmiere is made in Germany also. 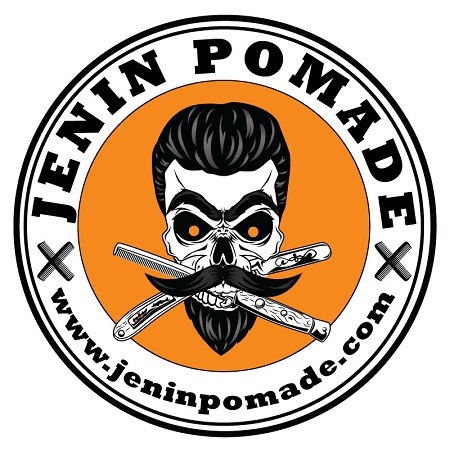 Its creamy and medium consistency is perfectly suited to shape normal and thick hair to a pompadour. Even if you comb your hair tight back, you will be pleased with this "Schmiere"!Once applied on the hair the "Schmiere" holds the whole day long without getting hard-dry. While making your hair hold all day long it stays flexible at the same time.Beginners won't have difficulties to spread the pomade over their hair. Success will be achieved very quickly. Unlike other pomades this "Schmiere" can be washed-out easier. Mostly one application lasts only for one day, but you can fix that by "regreasing"!